It might look like a frozen wasteland, but beneath the inhospitable surface of Saturn’s moon Enceladus, life could be thriving in warm underground seas, scientists believe. Nasa’s Cassini spacecraft has picked up the first evidence that chemical reactions are happening deep below the ice which could be creating an environment capable of supporting microbes. Experts said the discovery was ‘the last piece’ in the puzzle which proved that life was possible on Enceladus, a finding all the more remarkable because the small moon is 887 million miles away from the Sun. Prof David Rothery, Professor of Planetary Geosciences, The Open University, said: “At present, we know of only one genesis of life, the one that led to us. Liquid oceans exist miles below the surface on Enceladus, so to find out what is happening in the underground seas scientists must rely on the plumes of spray which shoot up into the atmosphere through cracks in the ice. In October 2015 Nasa sent Cassini into a deep dive through one of those plumes and discovered hydrogen and carbon dioxide. In a report of their findings published today in the journal Science, scientists said that the ‘only plausible’ source for the hydrogen was chemical reactions between warm water and rocks on the ocean floor. Crucially, if hydrogen is present it can mix with carbon dioxide to form methane, which is consumed by microbes in the deep, dark seas of our own planet. “Saturn’s moon Enceladus has an ice-covered ocean, and a plume of material erupts from cracks in the ice,” said Professor Hunter Waite, of Southwest Research Institute (SwRI) in San Antonio, Principal Investigator for Cassini’s Mass Spectrometer instrument which detected the hydrogen. Cassini snapped the picture on Friday, the same day Nasa’s Mercury-orbiting MESSENGER probe imaged Earth as well. In that picture, Earth and the moon take up less than a pixel, but appear large because they are overexposed. The above image is only one footprint in a mosaic of 33 footprints covering the entire Saturn ring system (including Saturn itself). At each footprint, images were taken in different spectral filters for a total of 323 images. “The plume contains chemical signatures of water-rock interaction between the ocean and a rocky core. We find that the most plausible source of this hydrogen is ongoing hydrothermal reactions of rock containing reduced minerals and organic materials. Enceladus is the sixth largest moon of Saturn, and was discovered in 1789 by the British astronomer William Herschel. It is around 310 miles in diameter and approximately 790 million miles from Earth. Scientists had long suspected that liquid water could exist on the moon because of the extreme tidal forces acting on the satellite from Saturn’s gravity. In 2005 Nasa launched Cassini to explore Saturn and its moons, and in 2015 discovered that Enceladus wobbled slightly as it orbited the planet, which could only be accounted for its outer shell was not frozen solid to its interior. A global ocean must be present under the icy surface, the experts concluded. Since then, researchers have been studying data sent back from the spacecraft to see if the instruments on board had picked up any other clues that life might be present. The new results are the strongest indication yet that Enceladus has all the conditions needed for life to form. If life is present, it could resemble single-celled tube-like extremophiles which have lived in hydrothermal vents on Earth for billions of years. Prof Rothery, added: “We do now have the last piece of evidence needed to demonstrate that life is possible there. Enceladus is so far the furthest rock from the Sun that could support life in the Solar System. Some scientists think Uranus’ moon Ariel may have a liquid ocean, but it has not yet been proven. Although scientists previously thought Enceladus’ icy crust was around 13 miles thick, recent data from Cassini has shown that at the south pole, it could be as little as three miles deep. 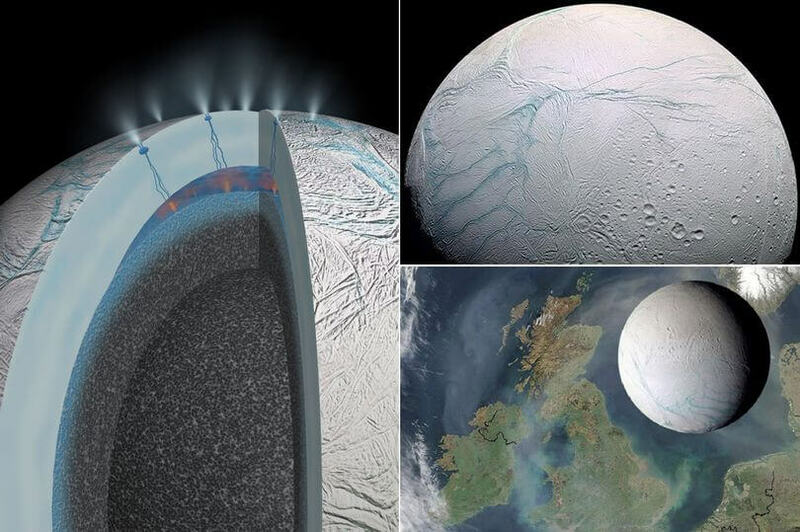 Commenting on the new research Dr David Clements, Astrophysicist at Imperial College London, said: “We have long suspected that hydrothermal processes are behind the Enceladus plumes and the liquid ocean that fuels them, so this result is fully consistent with that picture. “This discovery does not mean that life exists on Enceladus, but it is a step on the way to that result. Prof Andrew Coates, Professor of Physics at UCL, said: “This is an exciting and remarkable result which shows that Enceladus may actually be habitable.